ShopRite: Food Should Taste Good Chips & More ONLY $0.17 Each Starting 10/14! Starting 10/14, ShopRite will have Muir Glen Organic Tomatoes priced at $2.00 each and Food Should Taste Good Chips priced at only $2.50 each. 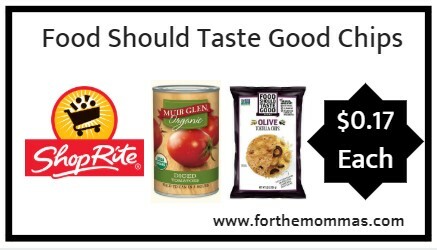 In addition to this price, we have $0.50/1 Muir Glen Organic Product printable coupon and $0.50/1 Food Should Taste Good Chips printable coupon to use on this deal. Stack it with a ShopRite ecoupon that will make your final price $0.17 each. Also available: $0.50 Muir Glen and $0.50 Food Should Taste Good Savingstar rebate.